The ukulele is a great instrument for people of all ages and is particularly accessible and appealing to young children. Not only is it a good ‘stepping stone’ onto guitar, but also a great instrument in it’s own right. Its popularity has grown enormously in recent years and there’s even a internationally renowned ‘ukulele orchestra’. Being small and only having four strings makes it slightly easier for young starters compared to the six string guitar. It can be played in the same way as guitar i.e. you can strum chords, play melody lines and perform ‘finger picking’ techniques. 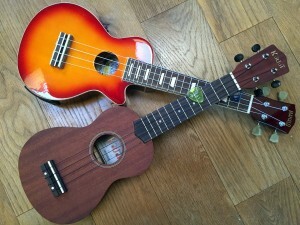 See our ‘YouTube’ ukulele demonstrations. We can teach ukulele in larger groups of up to 8 pupils for 30 minutes, making the cost of lessons half that of keyboard and guitar. If your child starts ukulele lessons your initial payment will be for a ‘package’: ukulele, tutor book and the first 4 lessons. The current cost of the package is £50. After that, lessons will be invoiced in advance for each half-term. Each new pupil also receives a folder and Musicworks notebook. All of which, including the ukulele and tutor book, should be brought along to each lesson and taken home between lessons to practise on. The penny whistle is a very traditional instrument and has been around for very many years. As its name suggests, it is probably the cheapest instrument you can buy and also, due to its size, is very portable. In a way it is a very similar instrument to the recorder but perhaps slightly easier to play. Each penny whistle can only play in 2 or 3 different keys due to its ‘tonal’ design. You can therefore buy whistles in different keys with ‘D’ being the most commonly used. More expensive and ‘specialist’ penny whistles, made from various materials, are available for the more discerning player. The cost and payment method for penny whistle lessons is similar to that of ukulele (above), with the initial package including a whistle and a tutor book. A folder and Musicworks notebook is also provided to all new starters. Penny whistle pupils can now take LCM graded examinations with the ‘Irish and Scottish Traditional Music’ syllabus. Please visit our ‘YouTube’ penny whistle section to hear a more ‘modern’ twist on this instrument, as well as some traditional tunes.